For starters, today I want to give a shout out to all those bloggers who are able to take Instagram worthy food photos. It is all I can do to grab the cell phone and snap a photo of my creations while my kids are screaming for dinner in the background. 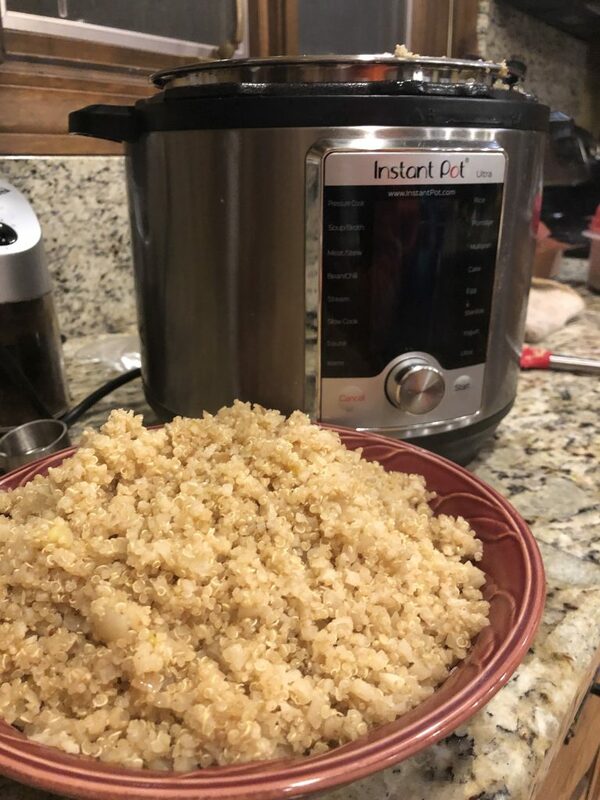 I’m trying to keep it real here – with quinoa on the lip of the pressure cooker, no fancy backdrops, and whatever. Anyway… on to the recipe. I started with a pilaf recipe from The Instant Pot Bible by Bruce Weinstein, and then adapted it to what I had on hand in the house. The final recipe is much simpler than the original. And isn’t that what cooking is all about? The original recipe caught my eye because it contained quinoa, which is super healthy and super quick to cook, especially under pressure. One of the things my family does during dinner is talk about the nutritional benefits of the foods we are eating. I find quinoa especially interesting since it is one of the few plant based proteins that contains all nine of the essential amino acids that are commonly found in meats. It is also a great source of manganese, phosphorus and fiber. Be sure to rinse your quinoa before cooking it. You may be able to save yourself this step if your quinoa is pre-rinsed – check the bag to find out. I used homemade vegetable broth. It is so much tastier than the stuff I find at the store and worth the extra trouble, in my opinion. One of these days, I will try to post a recipe for vegetable broth on this site, but in the meantime, a good pressure cooker book should get you started. Or try this recipe over at Hip Pressure Cooking for Vegetable Broth. To make this recipe super easy and quick, I used frozen, riced cauliflower. If you have fresh cauliflower, break it into small pieces, and increase the cooking time to 6 minutes. Preheat the base of your pressure cooker using the sauté setting. Sauté the onion in the butter for 2-3 minutes until it is soft, but not browned. Add the garlic, cumin seeds and ginger powder and sauté briefly (about 10-30 seconds) until you can smell the spices. Turn off the heat on the pressure cooker. Add the quinoa, cauliflower and stock. Stir to combine. Lock on the lid of the pressure cooker and set the cook time for 1 minute on high pressure. Double check that the pressure valve is closed. Turn off the "keep warm" setting, if your machine has one. Once the cooking has completed, release the pressure using a quick release method. Fluff the pilaf and serve.